One of our largest newspaper collections, this collection is a compendium of 6,072,877 pages in 239 newspaper titles published in various cities and towns in the state of Massachusetts from 1704 until 1974. There is a particular emphasis on papers from Boston and surrounding locales. Produced by MyHeritage in a partnership with the Boston Public Library, this extensive collection spans from the colonial era through the late 20th century. Most of this content can only be found on MyHeritage and in the Boston Public Library. An important resource for genealogy and family history research, newspapers contain obituaries and other vital record substitutes such as birth, marriage, and death certificates. Additionally, society pages and stories of local interest contain rich information on activities and events in a respective community and often provide details about the people involved. Extensive information may be discovered from these society pages or sections. Everything from seemingly mundane certificates and reports on events such as parties, job changes, hospital stays, and social visits by friends or relatives. These pages are a hub for historical events that are unlikely to exist otherwise. From this collection is the Boston Post article from December 18, 1900 describing Helen Keller’s first public appearance. Keller addressed her fellow freshman classmates at Radcliffe College, and was welcomed with a rapturous applause. This collection, comprised of 11,368,616 records, is an index of marriage licenses filed at the New Jersey State Clerk Offices from 1915 to 2016. The index includes the first and last names of each spouse, the year of the license application, and the state file number. Marriage records are an important genealogical record as they not only record spousal information and their residence when married, but often contain additional information such as birth dates, birthplaces, occupations, and whether single, widowed or divorced at the time of the marriage. This content in the New Jersey Marriage License Index, 1915- 2016 comes from two indexes: an index to marriages categorized by brides and a separate index to marriages categorized by grooms. The records published here have, in most cases, been matched to unify the information of the brides and the grooms in their respective marriages. The collection does include a small number of records that could not be matched. Copies of the original marriage records found in this index can be requested by the State Archive. Through the incredible efforts and activism of Reclaim The Records, images were able to be included in this collection. 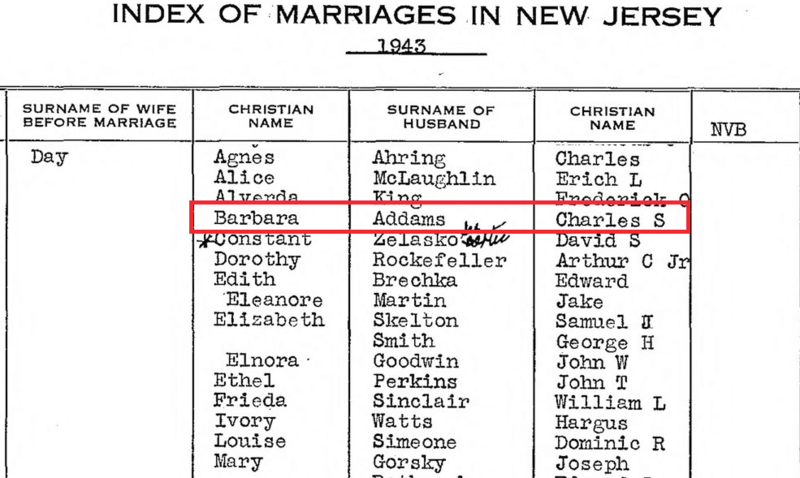 Drawn from the collection is the marriage record of American cartoonist Charles Samuel Addams and Barbara Day. 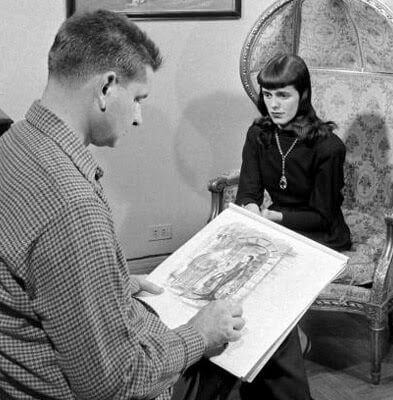 Most famous for The Addams Family cartoon, it is said that Charles took inspiration from his wife Barbara when sketching the character of Morticia Addams. The New York State Death Index contains information on death records in New York State. This collection helps individuals locate New York State death records between 1880 and 1956. This index contains information on place and date of death, gender, age at death and their State file number. The images in this collection have been obtained through the efforts of Reclaim the Records. In this collection, is the death record of Carrie Chapman Catt. Catt was an American women’s suffrage leader who campaigned for the 19th Amendment, granting women the right to vote. 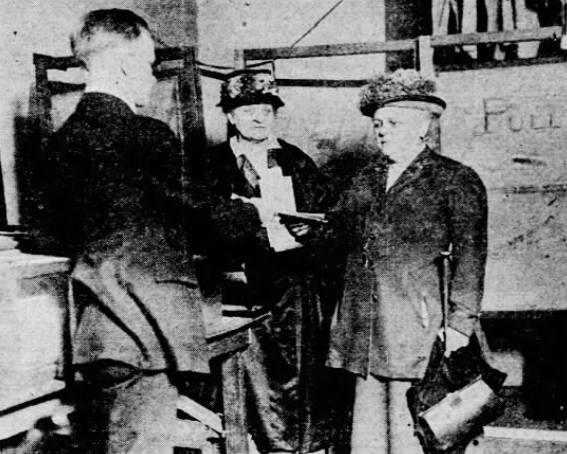 Catt served as president of the National American Suffrage Association and was the founder of both the League of Women Voters and the International Alliance of Women. This collection is a card index of naturalization records in Northern California district and circuit courts for the years 1852 to 1989. Naturalization requirements changed significantly in the year 1906. Prior to 1906, naturalization petitions required a limited amount of information, often only the name of the petitioner, name of the court, record number, petitioner’s country of origin, and date of naturalization. After 1906, naturalization documents included fields for additional information, such as the petitioner’s address, birth date, date and place of arrival in the United States, as well as names and addresses of any witnesses. However, while the post-1906 petitions aimed to collect this additional information, in actuality not all of them did. Petitions for naturalization were one of the final steps towards United States citizenship. These documents are of particular interest to genealogists because they sometimes included multiple surnames, often alternate spellings or their “old country” name as well as their “Americanized” name. The California Gold Rush spurred as many as 300,000 people to move to California seeking prosperity and wealth with San Francisco being the largest and most significant immigrant destination. With the discovery of gold in 1848, San Francisco’s population grew from 1,000 residents to 25,000 residents in a single year. This rapid growth included not only US citizens traveling west in search of wealth but many foreign immigrants seeking a brighter future as well. This influx resulted in the establishment of many migrant communities, the largest being San Francisco’s Chinatown. In 1859, the Comstock Lode silver discovery confirmed that California was a place where fortunes could be attained. Furthermore, with the completion of the Transcontinental Railroad in 1869, California now became more accessible to European immigrants arriving in the Eastern US. Along with the immigration wave, however, there was a surge in xenophobia. The passage of the Chinese Exclusion Act in 1882 significantly limited Chinese immigration to the United States until 1943. Then in 1921, following the Russian Civil War, an influx of Russian immigrants arrived in Northern California. Russian immigrants, particularly Russian Jews, fleeing the Soviet Union would find a new home in San Francisco. The “California Dream” has enticed millions of immigrants over the course of two centuries, making California immigration and naturalization records a valuable source for genealogists. All of these exciting collections are now accessible through MyHeritage SuperSearch™. Searching these collections is completely free. 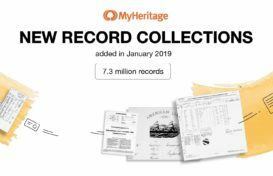 A MyHeritage Data subscription is required to view records from these collections and to save them to your family tree or to confirm Record Matches. Enjoy searching through these collections and let us know what you uncover in the comments below! Such wonderful and rich information! Thanks so much for all your hard work and time that you all have put into making this information possible. You are a stellar organization! So I am not surprised by your accomplishments by adding such important historical data to your impressive company! I so enjoy My Heritage with my ancestry research! Kudo’s to an organization who also embraces the true concept of customer service, I must comment on the 3 times I have been in communication with your specialists, they were always very polite and so very knowledgeable! Especially impressed with the fact that the 3 contacts I spoke with were from Ireland and Israel! Keep up the good work! What about Texas? That’s my interest. We’re working on adding Texas newspapers in the next few months. Stay tuned! Wow that is a lot of data, maybe in time you will get info. for places and time period I am interested in. Im trying to find more details about my family name. My great grandfather was from cork but married in India. I signed up wiwth your Co because I wanted info re: my half brother who was awarded the Bronze Star. Want to know how and when it was awarded. His name: Arthur L. Streeter (WWII) Let me know if more info is needed.